There is good news for Jobs seekers who are looking for the government job Uttarakhand Post Office department. Here, in this post, we are going to discuss all the information regarding the Uttarakhand Postal Circle GDS Recruitment 2018 in the below sections of the post. This is a golden opportunity for those aspirants who want to make their career bright in Uttarakhand Postal Circle department they must focus on this full article & then candidates may apply for this Uttarakhand Post Office Vacancy 2018 from the official web portal of Uttarakhand Postal Circle that is www.indiapost.gov.in. Forgetting the latest updates then scholars can bookmark our careerjobs360 official website and stay in touch with us for future purpose. 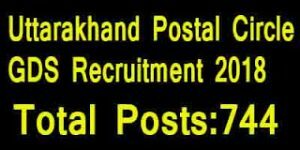 The Uttarakhand Postal Circle Department has revealed an official notification for UK Post Office Recruitment 2018 for the placement of educated and efficient candidates for filling 744 Gramin Dak Sevak Posts in the department. Uttarakhand Post office is going to recruiting the well deserving & eligible competitors for the post of GDS in the Postal Circle Department in Uttarakhand State. The Contenders who want to do a Government job in Uttarakhand then they may apply online for the Uttarakhand Gramin Dak Sevak Recruitment 2018 from the official portal on or before the end date that is 20th June 2018. For moreover, elaborated information about the Uttarakhand Post Office Vacancy 2018, such as required qualification, age criteria, key dates, application fee, selection procedure and how to apply etc are mentioned below. Kindly go through it. Interested participants who are willing to apply online for Uttarakhand Postal Circle GDS Recruitment 2018 they must read the eligibility needs then they can fill the online application on or before the deadline date i.e. 20th June 2018. Here, we provided age criteria, educational qualification, application fee, selection process, key dates and how to apply in the below post. Academic Qualification: Candidates must have done the 10th/ Matriculation & should have minimum 60 days computer training certificate from any recognized Board. For more details Aspirants must visit the official advertisement of the recruitment. Minimum age Limit of the competitors should be 18 Years. Age relaxation is applicable for the reserved category as per the rules and regulations of the govt. Selection Procedure: Contenders will be selected based on the basis on the merit list. Application Form Fee: Aspirants of general category must have to pay Rs. 100/- as the application fee. SC/ ST/ Reserved category contenders are exempted from the application fee. Pay Band: Selected candidates will get handsome amount of pay band of Rs. 5200 – 20200 + GP Rs. 2000/-. How to Apply Online for Uttarakhand Postal Circle Recruitment 2018? Interested contenders may apply online for Uttarakhand Post office Jobs 2018 from the official web portal which is given at the last of the post. Here, we provide some steps for applying for the mentioned post easily. All the contenders must follow all the provided steps and then you may fill the online application form. After that, open the link in the next web page. After that Read the official advertisement very carefully, & check whether you are eligible to apply or not. If you are eligible then you can fill all the required information accurately in the application form. Attach the required certificates with the application form. Upload recent passport size photograph & signature on the application form. Now, check all the filled details in the application form before submit it. Finally, take your printout copy of application form and keep it for future use.